Top-notch real estate pre-license education with all the trimmings. Package includes your first-year renewal education, bound textbooks, and EA real estate designation course. The OnlineEd Oregon Real Estate Broker Pre-License Training course is the ONLY online Oregon real estate pre-license course authored and instructed by practicing Oregon principal real estate brokers. With OnlineEd, you get an Oregon course written by experienced Oregon authors. 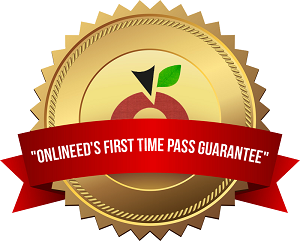 With OnlineEd's Big Value Bundle you'll receive over $900 in products not offered by our competitors. Please note: The course is designed for online delivery and books are in no way required for course completion. Books are offered as a convenience for those who prefer to study away from their monitor and as an additional study aid. Books are not to be considered a substitute for our online course. While the book will follow the online course outline, text may vary due to our ability to update online information and our inability to update your textbook after it is purchased. Quizzes and final exams are required to be taken online. More than $900 in extra value! Our Big Value Bundle includes everything you need to complete your education and pass your real estate licensing exam. Let the Real Estate Master IIIx put answers to all your financing problems at your fingertips. Carry it with you on appointments with clients and impress them with your financial expertise and instant answers. 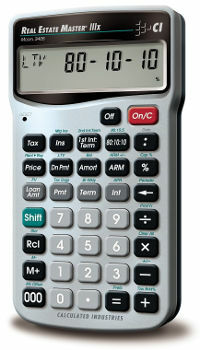 Calculate complete P&I, PITI and FHA payment solutions, amortization, Rent vs. Buy comparisons and much more. Broker Advanced Practices is a 27-hour course that all real estate licensees must take for their first license renewal after becoming state-licensed real estate brokers. Licensees are also required to take a 3-hour Law and Rule Required Course (LARRC) at every license renewal. This package bundles these courses with your pre-license education, saving you money in the future when it comes time to renew your real estate broker license! This comprehensive green accreditation course, presented by Earth Advantage, an educator in environmentally-friendly building practices, will provide real estate professionals with a competitive edge in communicating features and benefits for green and energy efficient home opportunities in their market. Completing this 8-hour course will reward you with the Earth Advantage Broker real estate designation, giving yourself a client advantage over other real estate licensees with your knowledge on green housing features. FIRST TIME LICENSE RENEWAL COURSE (Required) - This course is approved by the Oregon Real Estate Agency (OREA) and complies with Agency requirements for Oregon licensees who are renewing their real estate broker license for the first time. Licensees are required to take 30 hours of continuing education every 2 years to keep their broker license active and must complete a 27-hour Advanced Practices course and a 3-hour Law and Rule Required Course (LARRC) at their first license renewal. Each topic segment is divided into smaller segments that cover specific facts, information, and details. Short questions will appear between pages to help students comprehend the presented information. There may also be open discussions where students can give their opinions based on what they've experienced during their first few years as real estate brokers. At the end of the course is a 60-question final exam. The final exam is not timed, requires a minimum passing score of 75%, and can be taken as many times as necessary to pass. After successfully completing the final exam for this 27-hour course, a course completion certificate will be generated. This certificate should be printed and kept with your education files as proof of meeting the OREA-required first-time renewal education course. You are not required to send this certificate to the Agency, but must have it available if the Agency requests it. Note: Oregon Real Estate Agency regulations now require students to spend the required amount of seat time on continuing education courses. Students will need to study the materials for 27 clock hours (50 minutes per hour) before gaining access to the final exam to complete this course. This 2018-2019 updated LARRC is designed to inform Oregon licensees of new law changes relating to real estate as passed by the Oregon Legislature. The Oregon Real Estate Agency requires that all licensees take a Law And Rule Required Course (LARRC) as part of their 30 hours of continuing education credit. This Oregon real estate course consists of timed video presentations and online reading materials. A continuing education course completion certificate will be issued after completing the course materials. This online course is approximately 8 hours long. It consists of 3-5 minute video presentations divided into 5 modules. Students can start or stop their viewing at their own pace and easily resume the course at another time. Short quiz questions and activities may appear between video sections to help you remember the content covered in the videos. A 35-question final exam is presented at the end of the course. This course will remain available to students for 90 days after purchase.